Geothermal | Wm. Masters, Inc.
You don’t have to dig up your backyard to find out that there’s value hidden there. The energy buried in your backyard could be saving you money. Yes, we are talking about natural energy from the earth. Geothermal heating and cooling systems use the earth to keep your home comfortable year-round at a low monthly cost. 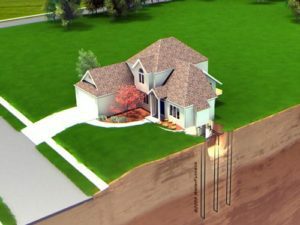 These geothermal systems can translate into substantial energy savings for you, and up to a 60% decrease in your electric bills. This renewable energy from the crust of the earth is an unlimited resource, and the WaterFurnace geothermal systems we trust utilize this efficiently. By using the earth to provide up to 50% of your home or building’s heating and cooling needs, WaterFurnace geothermal systems are the most practical choice for energy saving and home comfort. The WaterFurnace system operates without a flame, chimney, or fumes. There is no ugly outdoor equipment needed, and because it does not burn fossil fuels, it emits no pollutants. This system delivers what you want and what our world needs -- low cost and environmentally safe operation. When you choose Wm. Masters, Inc., you receive the security of working with one of America's top WaterFurnace dealers. See our energy experts today for more information on the energy-saving WaterFurnace and other geothermal systems.